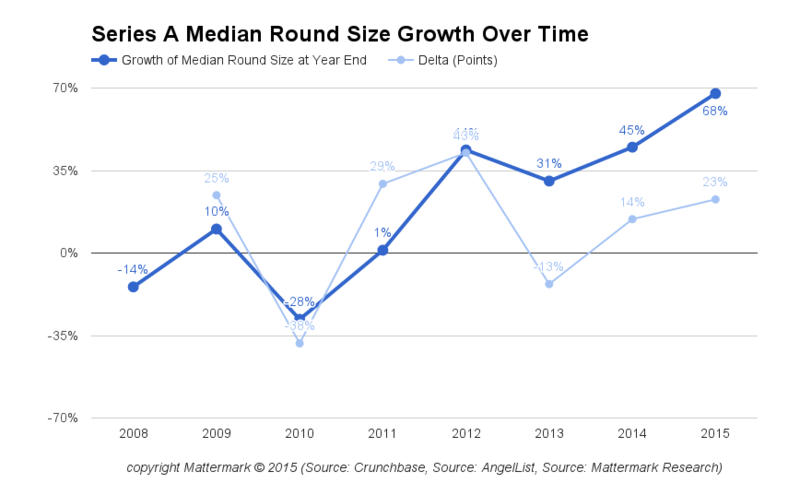 Last week, we reported on the continued rise of Series A round sizes (and therefore valuations, assuming ownership percentage requirements are remaining steady for the majority of deals). The median Series A round size in the U.S. is $6 million, and most recently in July came in at $7 million. When I looked at the most active Series A investors of 2015 I found something surprising: the median deal sizes for 24 of the top 25 most active Series A investors in 2015 were even higher. 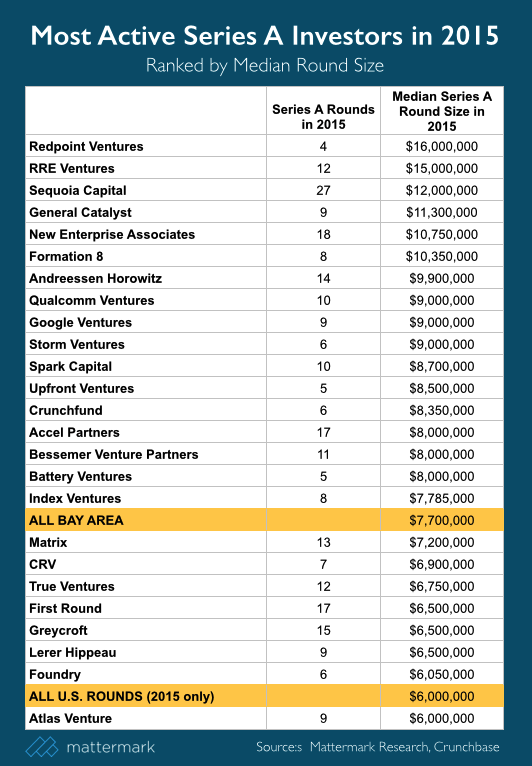 Some by just a little bit like Foundry Group (disclosure: a Mattermark investor) at $6.05 million median Series A, and some a lot like Redpoint at $16 million and RRE Ventures at a median Series A round size of $15 million. Editor’s Note: The table above shows the median Series A round size that these investors participated in, not the check sizes they wrote. It would not be crazy to assume that the higher the Series A round size, the higher the valuation of that round due to fairly standardized VC ownership requirements (unless it was co-lead). It may be that lettered Series __ round names are becoming less meaningful. Indeed, investors I reached out to confirmed that several of their announced A rounds “really looked more like a B”. Perhaps, similar to Mattermark’s own funding history, these companies had already raised enough seed funding on convertible notes prior to the round to make significant progress (another interesting analysis I’d like to do). Whatever the case, Series A rounds sizes continue to climb this year, and we will continue to report on this trend.